Repair of "large" Bucket Handle tear in Medial Meniscus? I saw my doctor and had an MRI done last week. He called me and said I had a "large" (and he emphasized large) bucket handle tear of my medial meniscus. The injury occurred 4 weeks ago. 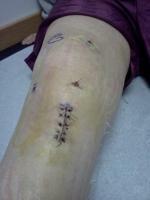 At first i wasn't able to straighten my knee because the torn cartilage had folded up and into my knee joint. I can move it pretty freely now though. From what i've read i know that they usually only repair tears in the red vascular zone. I believe my is torn beyond this point. I am guessing that if they chose to excise it they would be removing nearly half of my meniscus. Since the tear is so large will they opt for the repair surgery? I'm 22 yrs old and very active and athletic. I don't want arthritis in my twenties!